Hi, my name is Juliet Palante. Wederom een boek dat een noodzakelijke andere invalshoek biedt. Een Puertoricaanse lesbische tiener uit de Bronx die handvaten nodig heeft voor opgroeien, identiteit, feminisme en seksualiteit. Maar leuk en lief en frustrerend en interessant, echt waar. Juliet worstelt nog met haar identiteit en uit de kast komen, maar heeft veel hulp van een boek. Na een enthousiaste mail naar de auteur mag ze langs komen voor een stage, waardoor ze ook nog moet leren omgaan met een compleet andere omgeving (Bronx naar Portland). Juliet is heel erg een tiener, maar wel eentje die open staat voor nieuwe dingen leren, waardoor wat-een-tiener-frustraties bijna niet op komen borrelen. Ja, ze is koppig en ongeduldig en wantrouwend, maar ook zelfstandig, nieuwsgierig en kan kritiek aan. Het boek leest als een technicolor sneltrein, en ik kan mij niet herinneren wanneer ik het voor het laatst zo’n ontiegelijk menselijk YA heb gelezen. Dus doen voor de invalshoek, maar zeker ook voor de lol. Oh, wow, what an amazing, fun, emotional, realistic movie. I was interested because of the soundtrack (nineties hiphop and rap), and was so glad that everything else delivered as well. An original story with people of color that spun clichés and tropes and isn’t afraid to confront the viewer. Go see it. Malcolm and his friends are geeks obsessed with nineties hiphop. They dress like the artists, make music like them, write essays on them. He’s trying to get out of the criminal suburb he lives, aiming high with Harvard. Of course, life happens. There’s a girl, there’s a drugs dealer. There’s a lot of drugs and a muddy connection to those that could help him get into Harvard. What follows is a whirlwind of action, music, comedy and coming of age with from time to time a bit of fourth wall break throughs. Think about this, think about them, think about the society in which we live and where we are all part of. 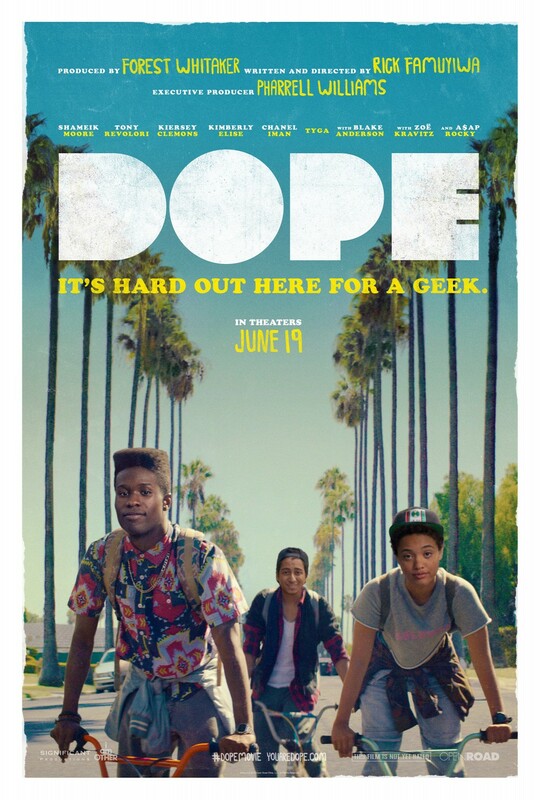 That doesn’t mean there is anything preachy about Dope. Those with an open mind will see and understand enough to know things need to change. I’m one of those readers that thinks that if you read one (good) detective, you have read all of them. Of course, it’s very hard to be (completely) original, but I think detectives definitely suffer from one set-in-stone trope. The detective is a (grumpy) loser who will have to work hard to prove that he is right, after all. Robert Galbraith (although by now everyone probably knows him to be a cover for J.K. Rowling) manages to at the same timer push the trope to the background and upholster it in a shiny new outfit. The author creates so many characters, so many (landscape) views, so many backgrounds, that it;s easy to forget about the detective case. It was suicide, everyone thinks so. Except the brother of the famous model, and he wants Cormoran Strike to prove it. Likely and unlikely suspects, witnesses and friends pass through while Strike ties the ends together. The Cuckoo’s Calling is a thrilling, whirlwind, exciting novel you want to race through. A second chance for this author, by me. I read something by him before, but felt like he was better at creating worlds, than keeping a plot together. But as I am a huge fan of a good case of world-building, I couldn’t resist giving it another try. This author has loads of awards and fans, maybe it was for a reason. Again, China Miéville creates a flabbergasting, mind-blowing world. He starts off with a speed that you can keep up with, but further into the book there are more and more details stacked on, making you page back to pick up the plot again, instead of enjoying the story. This isn’t necessarily bad, just demands a bit more attention from the reader. Main character Billy works in a museum. From the museum is a dead giant squid stolen. Besides him being the unlikely hero of different religions living in London, there are also a few apocalypses coming up and some gruesome bad guys that work hard to trigger and/or prevent those from happening. It’s an epic, and demands time and attention. It’s up to you to chose to give it. Gramps, who was born in 1990, once told me that when he was my age the only way to wind up in prison in the USSA (back when it had only one S) was to steal something, kill somebody, or use illegal drugs. So this is – at least partly – a YA version of Twenty-Thirty. Sadly the world building drops off for a hurried teen version of Prison Break mixed with a sport (football) story. Main character Bo (short for Bono), is the odd one out. In a super safe, barely criminal, society, he’s the one with half of the family in jail and a grandfather that keeps bringing up illegal things. Bo has an anger problem and that puts him into trouble: an one way trip a correctional facility. Life there is brutal and monotonous, but of course he manages to become part of an elite team pretty soon. And this team does illegal things: play something called football, without any protection. This looks like the right place for some Life Lessons, but Pete Hautman seems to be to enthralled by explaining several football maneuvers. The second half and ending seems to be a bit rushed, which really breaks the initial fun down. Not bad, not very good either.